Dancers are allowed to wear Lt. blue leotards or Black leotards but any style. Adhering to a dress code is an important part of a student's dance education. Along with proper classroom etiquette, following dress code shows respect for the art of dance, the teachers, and the student themselves. All dancers should have a bag to carry their shoes into the classroom. Shoes and bag should be clearly labeled with dancers first and last name. Creative Dance, Ballet: Lt. blue leotard, pink tights, pink ballet shoes. Optional: Black ballet skirt, black ballet sweater. Hair must be pulled up off of face. Tumble Dance/Acrobatics: Lt. blue leotard, footless pink or skin tone tights, no shoes or pink ballet shoes. 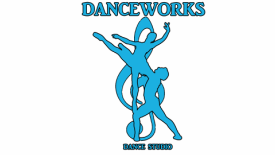 Hip-hop: Danceworks sweats or t-shirt, black or blue shirt and pants, no jeans, black jazz sneakers. Hair must be worn secured back and away from the face and off of the neck at all times, in all classes. For Ballet, hair must be pulled back into a neat, secure ballet bun.